Use to root cuttings of house, foliage, tropical and hardy ornamental plants. Herbaceous, leaf, greenwood and softwood cuttings. Use to root cuttings of house, foliage, tropical and hardy ornamental plants. Herbaceous, greenwood, softwood and hardwood cuttings. Use to root cuttings of more difficult to root woody ornamental plants. Softwood & hardwood cuttings. Dip the basal end of the cuttings 3/4 to 1 inch into the powder, one by one or in small bundles. Make sure that the powder is evenly distributed in a thin even layer (1/32 to 1/16 inch) over the whole base of the cutting. 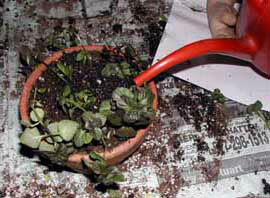 Too much powder on the cuttings might result in excessive rooting where there is surplus powder. Root formation can be expected all over the part of the cutting covered with the powder. Avoid contact between the powder and foliage and other over ground parts of the stem since it may cause phyto toxicity. Tap off the excess powder. 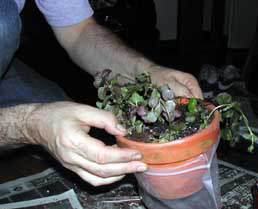 Plant the cuttings immediately in moist media. 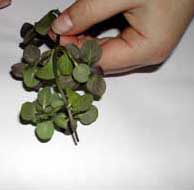 After treating cuttings take care of them. ►First prepare the cuttings by trimming to length and cleaning off the basal end. In this case the cuttings are from herbaceous herbs. 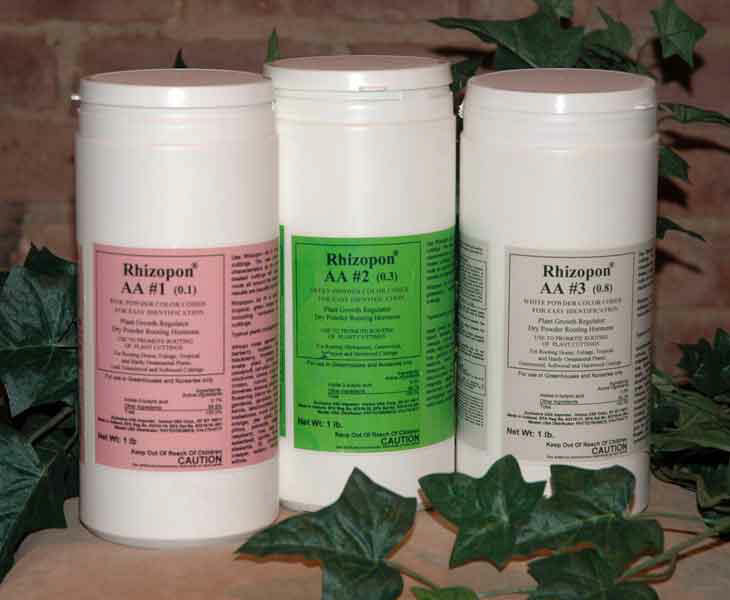 ►Dip the basal end of the cutting into the Rhizopon AA dry dip plant rooting hormone. Assure that the cutting is dipped into a portion of the powder taken from the stock container. ►Do not return the used portion to the stock pot to avoid contamination of the stock. ►Make holes in the soil media to plant the cuttings. Use a well draining soil to avoid the cuttings from becoming water logged therefore causing rot. ►Water the media until it is thoroughly moist. ►Protect the cuttings. 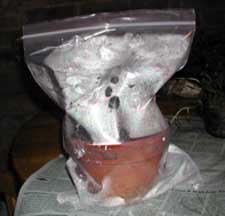 In this case the planting pot is put into a clear zip lock bag. ►Keep the cuttings in the best environment for root initiation. Here the bag is sealed. The moisture in the bag is kept inside so the plants do not dehydrate during the rooting process. ►Keep the cuttings in a warm place, not too hot and out of full sun light. ►Keep in a bright place. 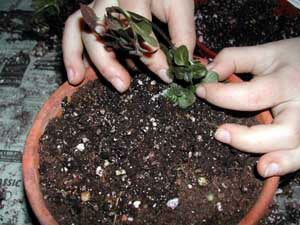 ►Check the cuttings after a week or so, by gently tugging on them, to determine if the rooting has taken place. ►After the rooting process has started, a few day later will open the bag to allow air circulation. Little by little, over a few days remove the bag completely.